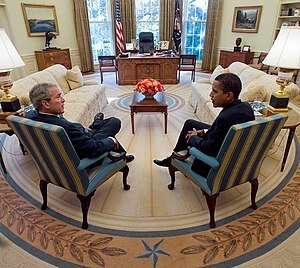 Bush Needs Four More Years…So Why Doesn’t Obama? If we ask people to honestly assess what they’ve seen happen over the last four years and take “parties” out of it, I’m positive that there isn’t one person who actually believed that in four years time, anyone, let alone one man, could get us back to the way it was especially since where we’d been had a false bottom. Why is it with public figures we expect more from them than we do ourselves? If this were you at (insert company name) and you were faced with rebuilding an office, you would expect to be given support and you’d be highly upset if no support was given and management walked in and laid all the blame at your feet as if they had no part to play in your failure. I was brought in to manage an office that had been managed into the ground by the previous staff and when I was brought in to do an “Obama” and clean it up, they instructed me to go in and get rid of the dead weight, hire replacement for said dead weight, bring the office back to code and oh, do all this and maintain goals and grow the office all while giving superior customer service! Being naive about what I was walking into, I thought that by doing what I was supposed to do, I’d receive the support that would enable me to successfully clean up and manage my office…it didn’t happen. I covered my end of the bargain but was left high and dry and I received no support from upper management and because of the lack of support, I and my office were unsuccessful. When they talked to me about why I was unable to perform at a satisfactory level, I was completely incredulous at their ability to talk to me as if they were completely devoid of culpability. Apparently, their job ended when they put me in office…I wish someone had informed me. I eventually was able to turn my office around but it took time and teamwork and it wasn’t until everyone realized their role that we were able to accomplish the original goal.